Welcome Health & Healing Professionals! A guide to using Dr. Miller’s most effective guided imagery programs in your practice or healing work. This section of DrMiller.com, dedicated to the support and training of health and helping professionals, is still under construction. The materials linked to below should serve as ample temporary introduction to Dr. Miller’s Professional Training and Support experience. you can return to our Homepage or visit our Online Store. Dr. Miller has offered professional trainings in Mind-Body Medicine since the early 1970s, when he lectured at Stanford’s School of Medicine, taught for the American Society of Clinical Hypnosis, and, at U.C. Davis Medical School, served as Preceptor and trained medical students in his office. He was instrumental in bringing widespread use of mind-body techniques (Read more about Dr. Miller’s teaching experience) to practitioners in Northern California in the 70s, particularly those involving the use of “altered” states of conscious such as meditation, deep relaxation, prayer, hypnosis and the like. He integrated the techniques of hypnosis, meditation, and prayer and merged them with traditional medicine and psychotherapy to help create what came to be known as the “Holistic” approach. Dr. Miller has championed the patient-centered approach, which recognizes the ability of people to contribute to their own healing process. His work has helped transform the very important field of hypnosis into a more humanistic, compassionate, and participative exploration based on a self-esteem, Deep Healing meta-model. Select a topic from the menu in the left navigation or feel free to read down this page for a general introduction to the Health Professional Center. Your own health, happiness, and well-being are as important as those of your patient/client/loved one. Please remember to take care of yourself . Dr. Miller has created a number of Guided Imagery Audio Programs for Treating and Preventing Caregiver Burnout. Dr. Miller specializes in teaching the tools and techniques for Deep Healing. Deep Healing focuses on nurturing the positive, healthy self and helping it throw off and resist illness and disease. It promotes the use of cognitive behavior training and hypnoidal states to catalyze a physical, mental, emotional and spiritual transformation toward healing, wholeness, joy and love. Most people have never learned to activate their inborn ability to heal, resulting in illness, dysfunction and disaster, personally, socially, and globally. Not only will you learn these tools and techniques in trainings or individual professional coaching sessions with Dr. Miller, you will learn how to use them guided by holism, spirit, wisdom, compassion, and love. These tools, regardless of the names they may be given (meditation, prayer, autosuggestion, creative visualization, hypnosis) are indispensable to the health professional who wishes to awaken and utilize the power of the deeper mind to heal. These perspectives and techniques will prove to be useful adjuncts to your work. Dr. Miller will offer trainings for your staff, class, school, company, etc. A custom talk or training also can be designed. The items listed below are those Dr. Miller feels are most useful ones for training of health and helping professionals. The foundational training experience, Deep Healing, The Heart of Hypnosis Level I has been published as a DVD. Without the in-person experience it cannot be considered a complete training, however, it presents Dr. Miller’s theory along with many practical tools that prove very useful in clinical and professional settings, as well as personally. It also provides an excellent review of these powerful clinical tools and extends the skills and understanding of those who have been trained and are using them in their practices or professions. Deep Healing, The Heart of Hypnosis Level I is provided with a Complete Manual and study guide for use with the DVDs. Those who are new to the field of Mind-Body Medicine are often skeptical, and with good reason. It was not until a few years ago that science started to pay attention to the remarkably central role our minds play in creating or healing illnesses and diseases. For those skeptics we offer this very brief introduction to the growing list of studies demonstrating how intimately the mind and body affect each other and the resultant health or illness. This section is under construction, and only a few colleagues have been listed thus far. Those who appear in this section were instrumental in the group effort of creating a new perspective from which to view health and wellness. Their pioneering work has been inspirational and instructional for Dr. Miller and it is with gratitude that he refers you to their continuing good work. These also constitute the advisors to whose wisdom he turns when encountering particularly thorny challenges. Dr. Miller’s desire has been to make his discoveries and the tools he has developed available to as many people as possible through professional health care providers. Forward thinking physicians and psychologists recognized the value in this very inexpensive way to give their patients a powerful means of reducing stress, tension, and anxiety, and have provided them for their patients and clients, or suggested they order them. DrMiller.com itself is an ideal patient/client education tool. It provides an enjoyable way for people to learn more about the basics of how the mind and body influence each other, and how they can optimize the behavior of both. The Learning Center provides easy links where your patients/clients can learn, in an empowering way, about stress management, as well as about Mind-Body Medicine, about Mind-Tools and Self-Healing, and about Stress, Anxiety, and Depression. You may also find Dr. Miller’s standard patient information handouts useful in your practice. Feel free to edit lightly and use; please credit Dr. Miller and link to DrMiller.com. Browse our Online Store to see Dr. Miller’s Self-Healing and Peak Performance programs. Select a product and you will find a wealth of information, including Dr. Miller’s theoretical and practical perspective along with how deep relaxation and guided imagery can be applied for this issue or illness – as well as how and when to recommend and use the product. The Professional Manual (see below) still under construction gives a more complete presentation for professionals. 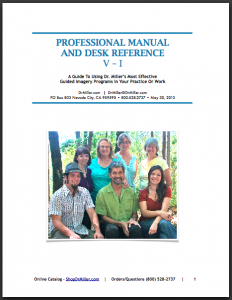 Download this guide to using Dr. Miller’s most effective Guided Imagery Programs in your practice or healing work.